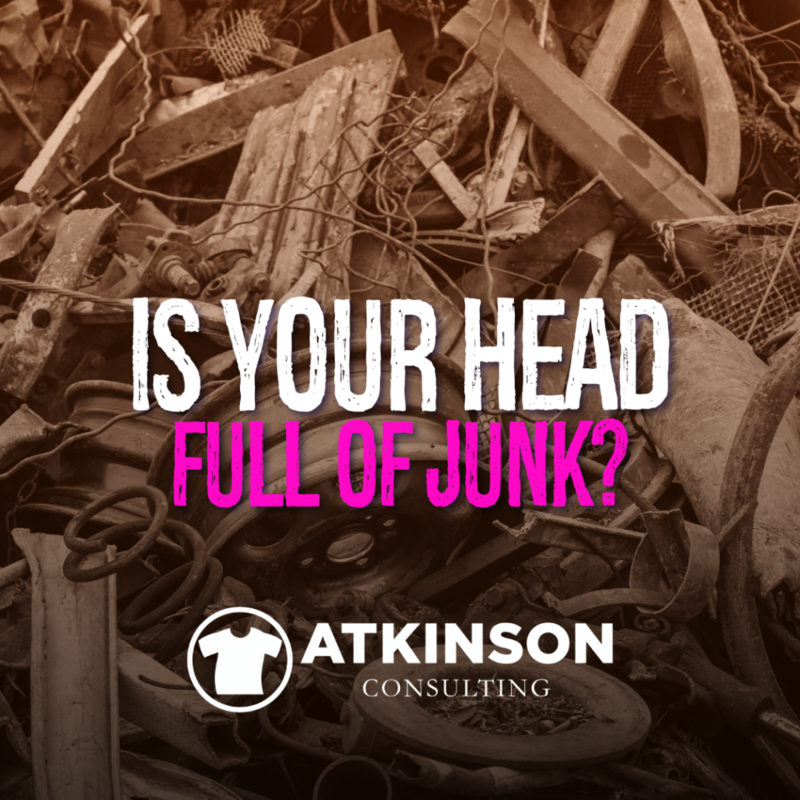 Is Your Head Full of Junk? Recently I spent about twenty or thirty minutes with one of my coaching clients who was slogging through a series of doubts about their business. Like they didn’t belong in the industry. Which was unusual because their business had a little over a million dollars in sales so far this year and they just added an embroidery machine to bring in that business in-house. They have had double-digit growth for sales for the last two years, and things are really looking up for them. I feel that way too. Probably everyone does. It’s perfectly natural to compare your shop to another one and feel like you are the junior varsity version in business. There is always a bigger, faster, shinier, something out there. Focus on you. Your business. The fact that your customers love you. Your employees too. The problem is that your head is full of junk. Who knows how or why you started collecting all of those doubts and insecurities? The answer lies in how you see yourself and your business. Let’s clear that junk by flipping the script. Take that negative statement, and turn it into a positive statement that reflects action. Sure, something is difficult…admit it. But if you frame that same thing with a more positive outlook that accepts the challenge and seeks help, you can more easily overcome the situation. There are plenty of resources for help in this industry. So if you are stuck with a problem like too many misprints, zero customers, or employee challenges…you don’t have to conquer that burden alone. Reach out and find the answers. How do you stand? Sit? Talk to people? Are you even aware of this? Sometimes posture and tone of voice can make all the difference in changing to a more positive outlook. People that sit or talk with their arms folded across their chest are protective of something. Make it a conscious point to keep your arms open and in front of you. Be accepting. Smile. Not just with your face, but with how you speak. Junk the junky way you are composing yourself and adopt a happier stance. It will affect those around you when you engage with people, and it circles back. Your employees hear and feel everything you say with an increased volume. You are the boss. They get it. Take it down a notch and be open. Smile. Ask about them. Often. Write out your problems. What’s bugging you? You can use this as an action list for problem-solving. When you run out of problems, start another list. Write out all of the awesome, positive things that come to mind. All of them. Both business and personal. It won’t be too long until the positive list will outgrow the negative one in length. This is a fantastic exercise to clear your mind of negative junk and replace it with positive ideas and thoughts. Also, if any of your customers have written and thanked you for a great job or recommended you to another customer, reread those emails. Sometimes you simply have to remind yourself of your awesomeness and power. Sometimes the reason companies in the decorated apparel industry feel inadequate is that there is a constant onslaught of other companies doing the same thing. It feels like we are all on the same rat-race chase for the same customers. To elevate your thinking, try this experiment. “…have great customer service.” – Who doesn’t have great customer service? C’mon, you can do better than that. “…has fantastic printing or embroidery.” – Another non-starter. There are plenty of great decorators out there. Try again. “…have superior quality.” – Oh, yeah? Compared to what? How can you prove that to your customer? This is a difficult problem to wrestle with, but if you figure it out your head junk days are over. Therefore, stop reading this and work out the answer. Hey, I know you like reading my blogs but sometimes you might need some help getting your shop moving in the right direction. That’s what I do. I’d love to hear about your shop. Your dreams. Struggles. That junk that’s bogging you down in your brain. Maybe I can help smooth out that speedbump. Grab a 15-minute call with me and let’s discuss how I work and see if coaching is right for you. https://atkinsontshirt.com/wp-content/uploads/2018/11/HEAD-JUNK.png 1080 1080 atkinsontshirt https://atkinsontshirt.com/wp-content/uploads/2018/10/ATKINSON-CONSULTING-HORIZ-256.png atkinsontshirt2018-11-10 05:00:072018-11-07 09:35:39Is Your Head Full of Junk?